The Deise claimed a ten point win in Páirc Uí Rinn. Waterford's DJ Foran in action against Cork. WATERFORD’S RECENT DOMINANCE of hurling clashes with Cork continued tonight as their U21 side stormed to victory in the Bord Gáis Energy Munster U21 hurling quarter-final in Páirc Uí Rinn. With the bulk of their team having gained recent senior experience, Waterford claimed a ten-point win to build on the county’s recent Division 1 league final and Munster senior semi-final triumphs. Success represented Waterford’s first in a game at this level since July 2009 and sets up a semi-final clash in Ennis on 15 July against Clare. Cork opened brightly to lead by 0-5 to 0-2 after the first quarter with midfielder Martin Brennan’s accuracy seeing him land a pair of points. But gradually Waterford gained a grip to dominate with Patrick Curran, who finished with 0-12 overall, in exceptional form in front of the posts. His converted placed ball in the 20th minute put Waterford into a 0-6 to 0-5 lead and they would never trail again. Shane Bennett raised a white flag shortly after and he would finish up with 1-4 for Waterford in a superb showing as he claimed the man-of-the-match award. At the break Waterford were in front by 0-9 to 0-6 and they accelerated clear in the third quarter to move in front by 0-15 to 0-9. Tadhg De Búrca was in outstanding form in defence and Waterford’s rearguard proved difficult for Cork to penetrate. The Rebels did prise it open to hit the net in the 56th minute with Luke Meade finishing tidily to the net after being set up by Sean O’Donoghue. But Waterford’s response was telling as they went downfield to raise a green flag in their next attack through Bennett and their passage to the last four was confirmed. Scorers for Waterford: Patrick Curran 0-12 (0-7f, 0-1 ’65), Shane Bennett 1-4, DJ Foran, Austin Gleeson, Stephen Bennett, Ryan Donnelly, Colin Dunford 0-1 each. Scorers for Cork: Luke Meade 1-1, Martin Brennan, Mark O’Connor (0-3f) 0-3 each, David Geary 0-2, Kevin O’Neill, Conor Twomey (0-1f) 0-1 each. Email “Another Waterford hurling win over Cork as they dominate Munster U21 tie”. 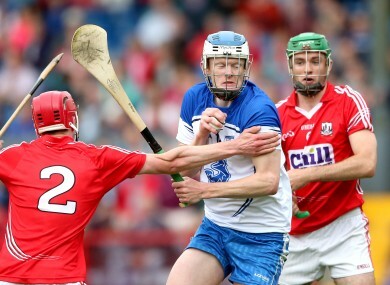 Feedback on “Another Waterford hurling win over Cork as they dominate Munster U21 tie”.